Also know in short as WATAMOTE. Watamote is a slice of life anime with some comedy and drama. Aired at July 9, 2013. Watamote is a anime about the girl. 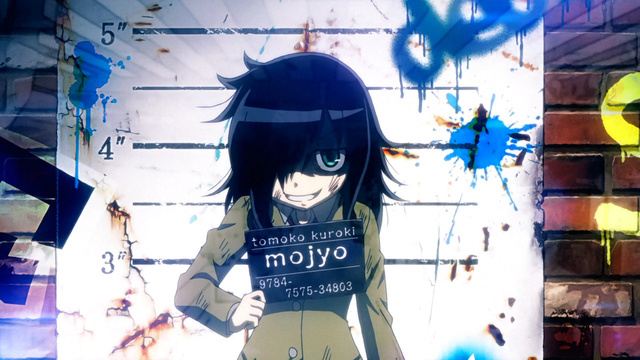 Her name is Tomoko Kuroki. She lives together with her parents and her older brother in Japan. THe first time we meet Tomoko is in her irst year of high school. We watch Tokomo live her life and take a look at how she lives and all the thigns she is going through. Tokomo is a unpopular girl with no friends what so ever. Yet she is able to stay positive even when all hope seems to be lost. SHe just doesnt give up and strives to become the most popular girl in the school. We see her attempts and how Tokomo might makes her dreams come true to be popular one day. What makes Watamote so special ? Watamote is not your daily slice of life anime. The anime is based around a girl who is struggling in her life. The anime is actually dark and really sad i you think about it but it does have a comedic spin to it that makes you laugh and smile instead of making you cry. We see how Tokomo goes through problems that are relatable to everyonein one way or another. Maby not every episode but I am sure that one or multiple things she faces you can easily relate to. That somehow makes the anime really good. Their is even a yugioh episode in the OVA !!! Does the anime deserve a 2nd episode? Hmm that is difficult to say. It is kind of personal but for me its a yes. The anime has a good concept and is enjoyable to watch. I would like to see a season 2 of this. On the other hand if they do it, it might get repetitive. The first seasona was really good the expectations are maby too high what can lead to a negative reaction from the fans. I do recommend this anime to others to atleast give it a try and watch a few episodes to see if you like it or not.